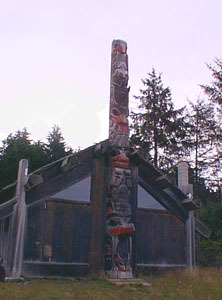 Old Massett is Haida, and stands on the site of three old Haida communities. This is a store called Haida Arts and Jewelry. I think. The Haida art is very distinctive. One of the things that they are known for is their button robes. Beautifully rendered in any combination of black, red, and white fabric, they are embellished with white buttons. They are stunning and quite dear. I finally bought a book on totems this week, because I just couldn't read them. By the way, low man on the totem pole is a GOOD thing.